This past Sunday was the first Sunday of Advent – in our church we lit the candle of HOPE, ushering in the Christmas season when we celebrate Jesus’ birth, The Hope of the World! Two thousand years ago, Hope was born in a manger, wrapped in swaddling clothes. Just the thought of that sends chill bumps down my spine. Jesus Christ, Son of God appears on earth and nothing was ever the same. Even the way we measure time was changed, from B.C. (Before Christ) to A.D. (anno domini “in the year of our Lord”). Jesus’ birth, life, death & resurrection changed everything. Hope was born. Truth had legs and feet. Faith was given breath. Grace rose from the dead. Joy was complete. The Gift of all gifts. A couple of years ago, my grandson, Simon, asked me why we keep our Christmas tree up all year round. I told him because it “wasn’t really a Christmas tree but my tree of hope.” Anyone who knows me knows that the very theme of my life is Hope. During a very dark time in our family, when we felt despair at every turn, God in His awesome faithfulness introduced me to a Hope that I had not known before. I was a believer, a strong believer and I had a close and personal relationship with Christ but I was overtaken by a great sadness. I wasn’t mad at God but I felt as though He had abandoned me – then it happened! Romans 15:13 jumped off the page of my Bible and flooded my soul and gave me back my breath. It was a light-bulb moment for me and I have never looked back. Hope is alive and sits at the right hand of my heavenly Dad – Hope intercedes on my behalf – Hope is my constant Companion. Hope never disappoints (Romans 5:5) and I rejoice in Hope (Romans 12:1). Do you know Hope? He died for you. He lives for you. He longs for you. He is everything that no one else can ever be. What a wonderful season to invite Him into your life. Romans 15:13 was the verse that got me through an extremely difficult time in my life some years ago and stands as one of those monuments of God’s faithfulness to me. HOPE… without it…there is nothing to look forward to! And I agree w/Helemarie…what you wrote is beautiful, everything you write is… and you really do need to write another book, you know it is true! All the doubts are passed away. 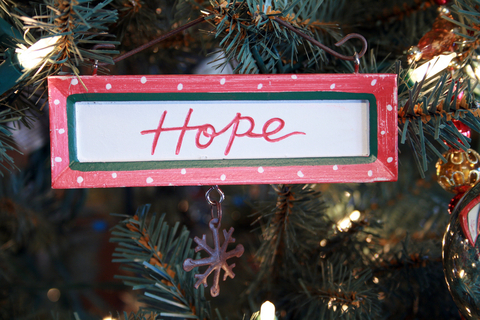 I have a Nativity ornament on my tree of hope – does that count?! A tree of hope is a great idea. Thank you for sharing hope all year. That tree goes wherever I go!!! Amen, and amen! I’m so glad that Jesus brought hope into our world and changes us! Like Oswald says, “Prayer changes things because prayer changes us.” Sort of like Hope!! !